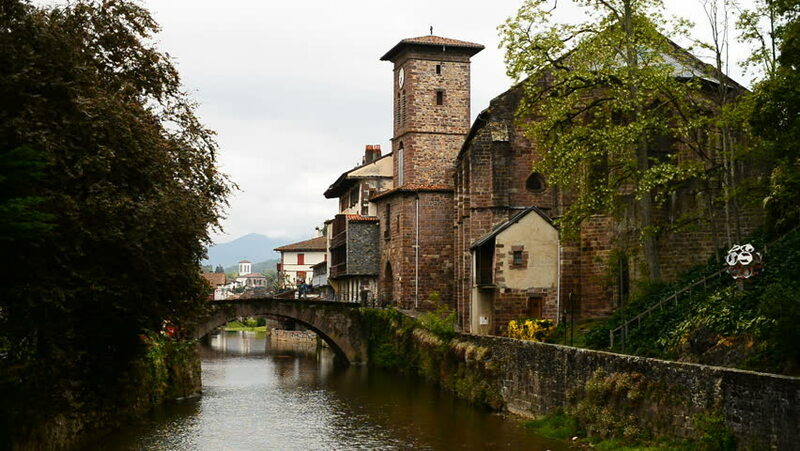 SAINT-JEAN-PIED-DE-PORT, FRANCE - 25th APRIL, 2017: Old capital of the traditional Basque province of Lower Navarre. It is traditional starting point for the Camino Frances de Santiago de Compostela. hd00:10STRASBOURG, FRANCE - CIRCA SEPTEMBER 2016: Medieval bridge Ponts Couverts is located in the historic district "Le Petite France" in Alsace, France. hd00:22STRASBOURG, FRANCE - CIRCA SEPTEMBER 2016: Medieval bridge Ponts Couverts is located in the historic district "Le Petite France" in Alsace, France. hd00:12GRUND, LUXEMBOURG - JULY 2002: City quarter Grund at River Alzette + pan Fortification Corniche. The fortifications and the old city were added to the World Heritage list in 1994.